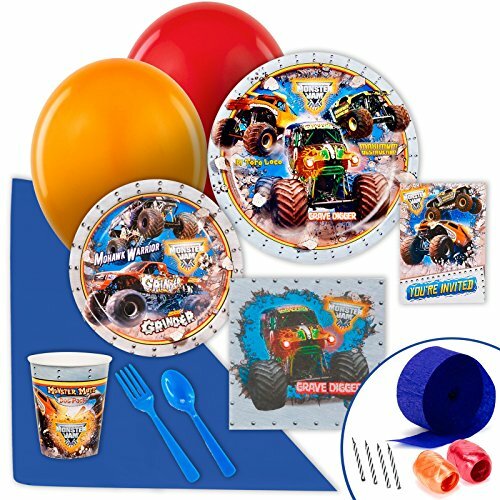 Includes (8) paper dinner plates, (8) paper dessert plates, (8) 9 oz. paper cups, (20) paper lunch napkins, (8) plastic forks and spoons, and a plastic tablecover. Includes 8 invitations, 8 dinner and dessert plates, 8 – 9 oz. cups, 16 lunch napkins, 1 plastic tablecover, 8 forks and 8 spoons, 24 candles, 12 latex balloons (2 colors), 2 curling ribbons (2 colors), and 1 crepe paper roll.